The rate of car accidents caused by alcohol have remained high each year in Florida, representing a failure to curb the numerous drunk drivers on the roads. DUI accidents can lead to serious injuries to innocent drivers on the highways and are a great cause for concern throughout the state. A driver can be doing everything right in their own vehicle and are side swiped, rear ended, or even involved in a head-on collision with a suspected drunk driver at any time of day. If you or someone you know has been injured from a DUI-related accident, you could be entitled to some compensation. Driving while under the influence of alcohol, chemical substances, or controlled substances within an unlawful blood alcohol level is a criminal offense in Florida, and is unfortunately one of the main causes of car accidents throughout Florida. In 2014, there were approximately 17,000 reported alcohol suspected crashes throughout the state of Florida. Out of this number, nearly 6,000 accidents were confirmed to be caused by alcohol. The Florida Department of Highway Safety and Motor Vehicles has put together a list of the car accidents caused by suspected or confirmed drunk driving. These numbers indicate that the majority of alcohol related accidents are caused by individuals between the ages of 20 and 30. The majority of all alcohol related accidents occurred in Hillsborough County and Miami0Dade county. Florida has participated in sporadic “no refusal” weekends which helped curb the incidence of drunk driving accidents on these weekends, where individuals could be pulled over for suspected drunk driving and a magistrate could order the individual to take a blood test (at any time of day). The “no refusal weekends” were suggested and funded by the federal government, although were only implemented on rare holiday weekends. After suffering through a DUI accident, you probably want nothing more than to just recover from your injuries. However, during this time, insurance companies will often try to get in contact with you to offer you settlement funds. It is important that you hold off on agreeing to a settlement amount from an insurance company. Insurance companies are in business to make money, which means they will only offer you a fraction of what your true injury costs are. A professional and experienced personal injury attorney can help you with calculating the total amount of damages you should be entitled to receive due to the accident. 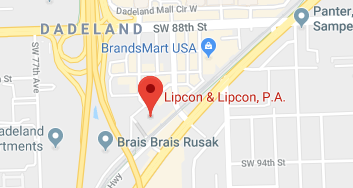 Whether it was you or someone you know that was injured in a DUI-related accident, call one of our attorneys at Lipcon & Lipcon. Our experienced attorneys have over 60 years of combined experience when it comes to handling injury claims after DUI accidents, and will work tirelessly to make sure you receive the compensation you deserve due to your injuries. The driver’s negligent behavior in getting behind the wheel has caused your injuries and emotional suffering. Contact our Miami office to claim your free consultation.